Barnard Castle School is an independent day and boarding school for pupils aged 4-18. Barnard Castle School were looking to redesign their existing website as they felt that as it had grown through the years the amount of disorganised content had become difficult to manage and hard for visitors to locate on the site. Research of analytics had also shown that the majority of visitors used mobile phones to browse the site, so it was important to create a mobile friendly responsive website so that no matter the device used every visitor would get the best user experience. Working closely with the school we develop a sitemap of core sections that would allow the site room to grow organically as they added more content to it. Using this sitemap as a base we then designed a site that would fit in with the already well established brand and ideals of the school. 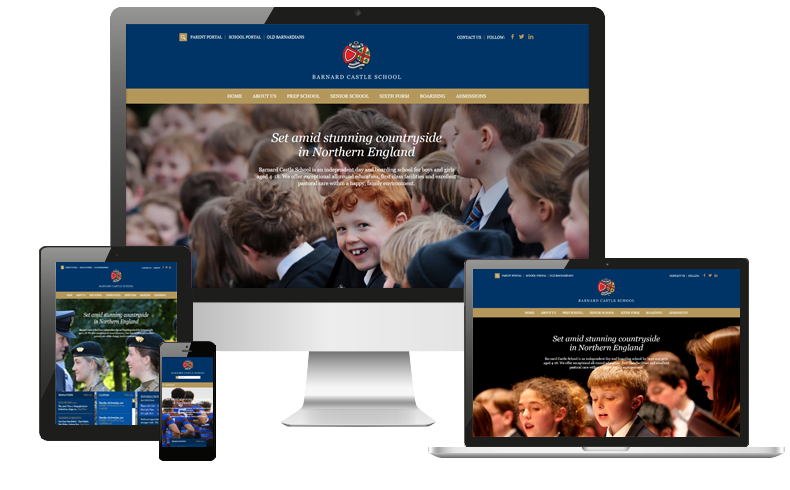 The fully responsive website was developed using WordPress, as it was felt that this would give the Barnard Castle School the ability to effectively manage the large amount of content on their site. It was also integrated with their school management software, ISAMS, which allows data such as their calendar feed to be pulled from the software and displayed on the website.